Protect the screen of your GALAXY Note 3 with this four-layer protective film. Designed to resist nicks, scratches, dirt and dust, as well as prevent fingerprints and smudges, this film will keep your screen looking like new. Get twice the protection with FlightFit, a customized case for your GALAXY Note 3 that's built from both hard and soft materials to deliver superior protection against shocks and scratches. 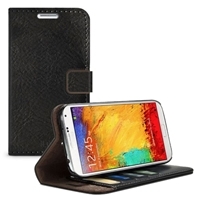 Indulge in a smooth, premium leather case for your GALAXY Note 3 that also doubles as a convenient wallet. Diary opens up like a book to reveal multiple pockets for your cards and cash on one side, and a hardshell cradle for your smartphone on the other.